In May, a time when hundreds of migrating bird species drop by New York City to rest and refuel, someone on my Brooklyn block discovered a male Scarlet Tanager in his backyard and took a picture for the local listserv. To us, the appearance of this gorgeous red and black bird on its way to the forests of the Northeast was a sign of spring. It used to be, when I was a child, that the arrival of robins was another. But nowadays in my neighborhood robins can be found in the bare branches of street trees all winter long. Where John J. Audubon once roamed, muralists now paint larger-than-life images of 314 endangered North American bird species. The Audubon report studies only temperature, precipitation and seasonal variables, not whether a bird’s new climate range will be viable in terms of vegetation, topography or food. “Trying to study how temperature lines up with the specific habitat that each bird needs is enormously complex,” National Audubon Society’s Jennifer Bogo explained to The Indypendent. “Even if the temperature further north is right, that habitat may not be a grassland or whatever it is that particular species needs.” Another unknown is how different species will react to climate change. Some will attempt to shift into the new range, while others, even as the environment around them becomes less viable, will stay put. Deadly heatwaves and increasingly frequent “100-year” floods are one way climate change is making its presence felt. Another is what some environmentalists call “slow violence” — when change happens so gradually or so far from the public eye that the damage can scarcely be perceived. In the Arctic, for example, which is warming faster than elsewhere, insects are emerging weeks sooner than they used to, with the result that the chicks of shorebirds, which have flown thousands of miles to breed there, are starving to death. The Audubon report identifies “strongholds,” habitat areas across the United States and Canada that the study shows will be especially important to preserve or protect. Each of the threatened birds has its own map, and consultants are on hand at Audubon to help local conservationists work with the data. But while National Audubon Society President David Yarnold sees identifying these strongholds as a cause for hope, he says that waging an all-out fight against climate change now is even more important. In northern Manhattan, a mural project is underway that aims to help people tune back in. Artists are painting images of the 314 North American bird species the Audubon report has so far identified as threatened or endangered by climate change. The project is a collaboration between the National Audubon Society and local art gallery owner Avi Gitler. 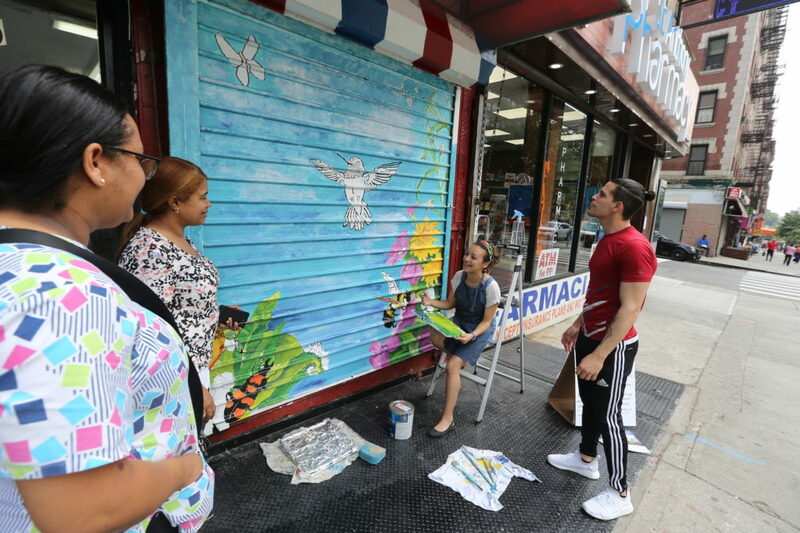 In 2014, when Avi opened a commercial art gallery in Hamilton Heights, Gitler & ____ on Broadway near 150th Street, he asked two artists to paint murals on nearby roll-down store shutters. The first artist chose a bird as his subject, so the second artist did too. 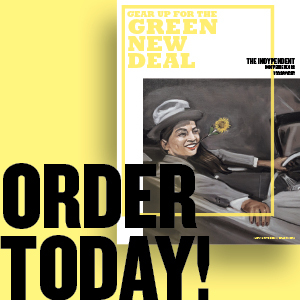 Not long after, Mark Jannot, a staffer at the National Audubon Society who lived nearby, noticed the murals and began talking to Avi about Audubon’s Birds and Climate Change Report, which had just been published. Out of this set of serendipities, the project was born. Yumi Rodriquez at work on her mural of the Rufous Hummingbird, Broadway and 161st St. Most of the murals can be found in the 140s and 150s along Broadway and Amsterdam Avenue. “We’ve concentrated the murals to make it walkable,” Avi, 38, told The Indy, “and we wanted to pay tribute to Mr. Audubon.” John James Audubon, the naturalist who documented nearly 700 species of American birds through his drawings, lived the last 10 years of his life in Hamilton Heights. His 14-acre estate overlooked the Hudson River and upon his death in 1851 he was buried nearby in Trinity Church Cemetery. People often leave offerings at the base of the Celtic cross marking his grave. 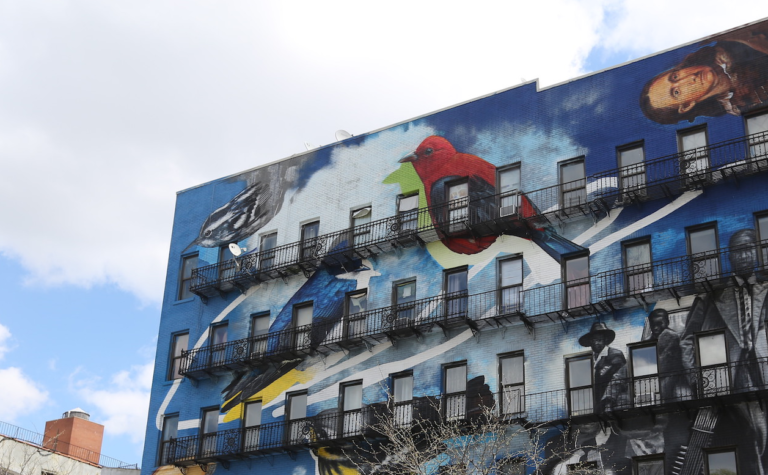 So far 102 species have been depicted, every mural another example, as one participating artist put it, “of how many ways one can paint the same subject.” I first viewed the murals on a Sunday morning in May when I joined an NYC Audubon walking tour. Riding the uptown #1 subway train, you can see the first murals around 133rd Street and Broadway, just before the train goes back underground. Two plump birds — a Bay-breasted Warbler and a Semipalmated Plover — face each other on adjacent roll-down store shutters, bright yellow orbs behind their heads as if they’re little avian saints. Up at 163rd Street near Amsterdam, the mood is decidedly grimmer: on a five-story wall two Tricolored Herons fight each other for the last morsel of food — a snake — while below them a third heron drowns in the rising waters of the melting glaciers. At 148th and Broadway, two Ovenbirds, whose normal habitat is the quiet recesses of a forest floor, perch atop a landscape of colorful graffiti-inspired shapes where the artist, a native New Yorker, imagines “the species’ unheard song joining the noise of the urban world.” According to the Audubon report, by 2080 a large chunk of the Ovenbirds’ breeding range will shift north into what is now treeless tundra. Not far away, on a roll-down shutter, a turkey metamorphosing into a man — or perhaps it is a man turning into a turkey — is a reference to Roald Dahl’s The Magic Finger, a story about inter-species empathy. Many artists paint with the aesthetics of the neighborhood or the request of a store owner in mind. One store owner, who requested something “aggressive,” got lightning in the background and a Peregrine Falcon, talons extended, coming straight for the viewer. Each mural is marked with audubonmuralproject.org, a website where you can learn more about the birds and the artists and donate to help defray costs. There is also a link on the site to Audubon’s Birds and Climate Change Report and to NYC Audubon, where you can sign up for a walking tour. 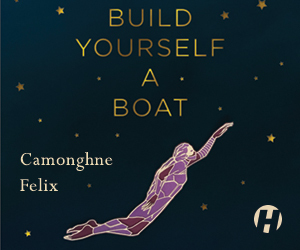 If you want to head out on your own, the site supplies a map. Since the project began in the fall of 2014, Avi has been its main organizer, soliciting most of the spaces — all donated by landlords or store owners — and selecting the artists, a diverse group ranging from studio artists who have never painted on a public wall to graffiti artists who were “painting subway cars back in the day.” Avi’s first preference is for artists from northern Manhattan, but artists from across the United States and from as far away as Australia have also come to paint. The project runs on a shoestring, mostly funded by the National Audubon Society. “The first conversation I have with artists,” Avi says, “is that nobody does the Audubon mural project for the money.” Artists receive supplies and some get a very small honorarium. For out-of-towners there is a “local hosting infrastructure” — families who will put an artist up for two nights and give them dinner. The project received a grant from the Rubin Foundation a year and a half ago but is otherwise supported by small donations from fans of the project. 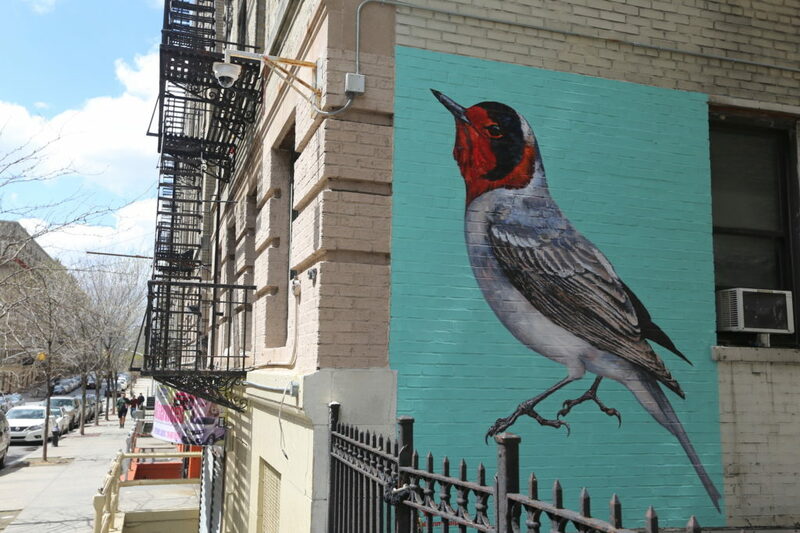 Red-faced Warbler at 601 W. 162nd St by ATM, a London street artist who uses art to help inspire a “re-wilding” of our cities and countryside. 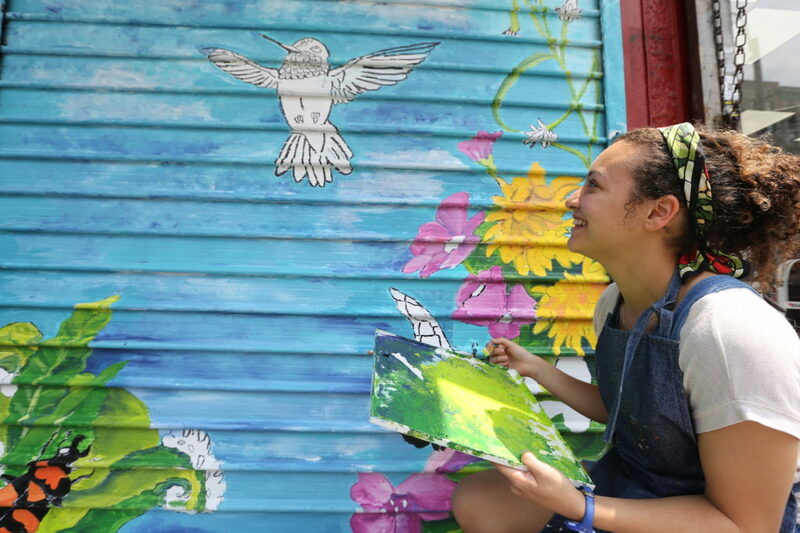 On a sunny afternoon in June, I catch up with Yumi Rodriguez, 25, sitting on a clear plastic tarp at the corner of 161 Street and Broadway, where she is chatting with neighbors and passersby as she paints a Rufous Hummingbird on the shutter of Romulo’s Barber Shop. Yumi is Dominican-American. She grew up across the street, raised by her grandparents. A hand-written sign propped among the paint cans explains in English and Spanish that the mural is in honor of her grandfather, Odalis Alvarez, who worked at the barbershop until two years ago when he suffered a heart attack. Now he is confined to his apartment. His pet name for Yumi, growing up, was Colibrí (hummingbird). Like many these days, Yumi works several jobs including as a veterinary technician and an illustrator of spiders at the Museum of Natural History. Her scientific training is obvious: in the mural’s center, a hummingbird, still just a sketch in black and white, hangs suspended in midflight surrounded by nine other endangered plants and animals including the Karner blue butterfly, Houston’s goldenrod and the rusty patched bumble bee. In real life, the Rufous Hummingbird is three inches long, but in Yumi’s mural it and all the other creatures loom large: “I’m magnifying these tiny creatures to raise awareness. People say, ‘Oh my God, they’re so beautiful,’ and I go ‘They’re in danger of going extinct, we just never see them.’” One of the insects depicted, the American burying beetle, is currently under threat of being removed from protection by Republican lawmakers who say those protections are inhibiting oil and gas companies. The plants and animals surrounding Yumi’s hummingbird were chosen not because they are part of its normal habitat but because she finds them “aesthetically pleasing.” She pulls up a photo of one of the plants — northeastern bulrush — on her phone to show me: “They have a brownish pinkish tinge of color which I like. I’m not sure if anybody pollinates these guys,” she says, her voice trailing off. But, she asserts, the point the mural is trying to illustrate — that nature is a web — still stands: without pollinators like the hummingbird and the bee, the plants that depend on them to reproduce will also perish. Yumi’s sign encourages people to stop and talk. Some even end up helping out — mixing paint or filling in between the lines. Every so often one of the barbers steps out to check on her. “They’re my security guard,” Yumi says. She’s been hassled several times by men, an experience that is perhaps more common for female street artists than is generally acknowledged. Yumi says considerations of safety have slowed down her progress some, but so too have all the positive interactions. This is Avi’s first public art project, and he’s clearly learning on the job. “I didn’t think about gentrification when I started this project,” he says, even though he grew up just 25 blocks north of his gallery. “I thought, if we paint birds how wonderful that would be. We were focused on beautification, on fixing up dirty walls.” Once, though, “two women told me they felt it was being done by a bunch of intruders who don’t know the history here.” Now, he’s more sensitive to these concerns, which is one of the reasons the project has begun to partner with more organizations, including a city playground, a public school and a community garden. When Yumi Rodriguez isn’t painting her mural at 161st and Broadway, she works as a veterinary technician and illustrates spiders for the Museum of Natural History. Stefen Reed, 39, is an African-American artist who was born and raised in the neighborhood. Currently he works with the Children’s Art Carnival, an arts education program that he began attending when he was eight. In the art world, Stefen goes by the name Ayobe, a transcription of the greeting “Hey, yo B!” His painting of an American Oystercatcher, its red bill plunging into a mussel, is one of 10 small canvases displayed in the windows of the Mobil service station at 155th Street and Broadway. There are also two building-size murals on either side of the plaza where people pump gas. In total, 23 birds are represented. Sitting on a stoop nearby, Ayobe and I agree there is a kind of irony in having the spirits of all these climate-endangered birds overlooking a gas station. Back in May when I joined NYC Audubon’s walking tour to see the murals for the first time, most of my fellow tour-goers were birders, many with binoculars slung around their necks. All of us knew that the project was about climate change because it was advertised as such when we signed up for the tour, but even so, we started out in high spirits, enjoying the art and the camaraderie. When we reached the Mobil gas station and were surrounded by the images of so many birds, however, the group fell silent. A woman near me said quietly, “Seems like all the birds we know are endangered.” Someone else wiped away a tear. For a few moments on that windy spring morning, the art made us stop, look up and see something larger than ourselves. This is not the first time North American birds have faced an existential threat — nor the first time that art has played a role in sounding the alarm. From the late 18th century on, feathers and avian body parts were the rage in women’s fashion, adorning dresses, hats, jewelry and fans. By the 1880s, five million birds a year were being killed, many destined for New York City’s “Ladies Mile,” a high-fashion shopping district in downtown Manhattan. There you could buy earrings fashioned out of hummingbird heads or a hair ornament made from the wispy feathers egrets produce during breeding. Killing the adult egrets during breeding season meant their eggs and chicks also perished. By the late 19th century, many bird species were on the verge of extinction. Then activists — led largely by women in local Audubon chapters — began to rally. One tactic protesters used was the “Audubonnet,” a beautiful hat constructed out of ribbons, flowers and lace instead of the feathers of migratory or song birds. Wearing one became a proud political statement. Their efforts led to what is still the nation’s most important bird protection legislation — the Migratory Bird Treaty Act (MBTA) passed by Congress in 1918. Protecting over 1000 U.S. bird species today, the law helped bring many species back from the brink of extinction. To mark the centennial of its passage, more than 100 organizations have declared 2018 The Year of the Bird. “We thought it would be a year to celebrate the MBTA,” Audubon’s Jennifer Bogo told The Indy, “but it’s turned out to be a year to defend it as well.” That’s because the Trump Administration has taken aim at the part of the law that holds industries accountable for birds accidentally killed when precautions like making power lines and windmills bird-safe or covering waste pits with nets are not taken. Trump wants industry held accountable only for birds intentionally killed, a directive that would eliminate the incentive for companies to follow best practices. Also eliminated would be penalties for disasters like the British Petroleum (BP) Deepwater Horizon oil spill, where, under the MBTA, BP was found liable for the deaths of one million birds and fined $100 million. “The money didn’t bring the birds back, but it did a lot in terms of cleaning up the habitat and funding additional science that would let us figure out what the birds needed and what really is happening to those different populations,” NYC Audubon’s Susan Elbin told The Indy. In May, the National Audubon Society filed a federal lawsuit ­­— Audubon v. Dept. of Interior — in defense of the MBTA. Audubon is encouraging the public to write to the Interior Secretary and their members of Congress in support of the MBTA. Photo (top): “Endangered Harlem” by Gaia, at Amsterdam and 153rd St., considers the migration of humans as well as birds. All photos by Elia Gran.